Successful e-commerce website design starts with applying the basics of retail success. To run a successful e-commerce website, you need to do what successful bricks-and-mortar retailers do. Follow these rules to get your e-commerce site visitors actually shopping online. Everyone in e-commerce or thinking of getting into e-commerce has this one figured out. Want a new car? Fresh spinach? A replacement part for your ancient typewriter? You'll find it on the 'Net. But a product, no matter how superior or well-priced, does not a successful e-commerce site make. Online, it's an e-commerce website. But think about the traditional retail store. There are products in the window to entice the customer inside. There are aisles leading to shelves of more products, all conveniently arranged for the customer. Navigation is critical to e-commerce website design; visitors to your online store need the same kind of visible, easy-to-follow pathways. They need to be able to examine your products and compare them with other products easily. And visitors to your online store need to be able to access your products easily. They can't just pick them off the shelf and carry them to the till as they would in the bricks-and-mortar store. The back end of your e-commerce site is just as important as your front end in terms of e-commerce website design. You need to arrange the supply and distribution of your product before your e-commerce site goes "live". You must be able to deliver on your promise to the customer. Too many e-commerce ventures collapse because the people involved didn't bother to secure the supply and distribution of their product ahead of time. What happens when people shopping online don't get the product they ordered in a reasonable amount of time or don't get it at all? They get angry, and chances are good, no matter how nicely you apologize to them, they'll never buy anything from you again. And they'll tell all their friends how unhappy they are with your crummy customer service. The retailer chooses a building for his store that is in good repair and has all the facilities such as electricity and heat that are necessary to make his customers comfortable. If the building isn't in good repair, he fixes the problems. Too many e-commerce entrepreneurs don't bother to do this. They throw up websites that have large sections under construction or have their sites hosted by providers that provide erratic or slow service. If a potential customer tries to access your website and it's down, what does she do? She clicks through to another website where she can view the products she's interested in. Will she be back? Probably not. You must have consistent, 24/7 hosting if you want to operate a successful e-commerce website. You must present a fully functional, complete store to get visitors shopping online. No 'Under Construction' or 'Coming Soon' banners. Usability is another important component of website design. For instance, if potential customers can't navigate your site easily, they won't bother. Pay special attention to the ease of the buying process. Your competition is always only a click away. And you must maintain your website regularly and often. An e-commerce site that's littered with dead links kills online shopping. An e-commerce website that never offers any new content will bore visitors. If you can't afford to maintain your site, you can't afford to have one. But even if you have an excellent website design, site visitors still may not shop from you. We will now discuss how to get visitors to your online store to trust you enough to become shoppers. Having a professional-looking, a fully functional e-commerce website is one way you build credibility with potential online shoppers. Just as in the bricks-and-mortar store, you must win your customers' trust before they'll shop online. You need to let your site visitors get to know you and your company as well as learn about your products before they'll start shopping online. 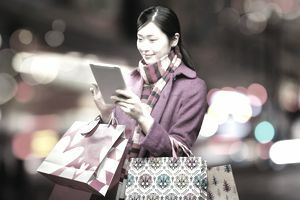 How does a bricks-and-mortar retailer build credibility with their customers and how can we do it on the 'Net? People shopping online need to see the product before they'll purchase it, too; incorporating an online catalog into your e-commerce website design can really help build credibility. But don't make the mistake of loading many pictures onto too few pages, resulting in pages that load too slowly and don't provide enough information. A good online catalog will use a lot of web pages; it will be organized into categories, searchable, use thumbnails to give faster load times, and provide detailed information on each product. An excellent catalog also provides stock information and makes it easy for the online shopper to purchase the product. Too many e-commerce websites are anonymous and provide very limited contact opportunities for people thinking of shopping online, a real blow to their credibility. Successful e-commerce sites provide real names as contacts, not pseudonyms such as 'webmaster' or worse, names that look like passwords, such as 'King1724'. They supply information about their staff and their company that the online shopper can access easily. Build credibility by putting a picture of yourself and/or your staff on your site. Customers need to have the feeling that they know you, or at least that they know something about you before they'll do any online shopping. Successful e-commerce websites also provide information about customer service and contact information that is clear and accessible. Having to drill down through 50 pages to find an email address printed in a tiny font on the bottom of a page will give your potential customer queasy feelings, not good feelings. Most won't even bother to search. They'll just assume that you're not the sort of person they want to do business with. Build credibility with potential customers by making your customer service information a prominent feature of your site. Put an 'About Us' and a 'Contact Us' or 'Customer Service' link on your e-commerce website's navigation menu and make sure it's on every page. And write those pages- if someone bothers to click on 'Customer Service' and all they see is a single email address, your credibility will plummet. Shoppers need to see a fully developed customer service policy to feel comfortable with online shopping. Many online stores use FAQs which provides answers to common questions, such as how to order, shipping charges, and return policies. No matter how small your e-commerce website is, you can now provide customer service in real time. Zendesk and LiveHelper, for example, are both Internet-based customer service applications that let your e-commerce website visitors get immediate, on-demand help. Lastly, if you want to get visitors to your store shopping online, you need to make it easy and safe for them to pay for their purchases online. Continue on to read more about e-commerce payment processing. Online shoppers want the same things from your e-commerce website that they demand from bricks-and-mortar retailers. You have to make them feel safe and comfortable before they'll start shopping online. Online payment systems and credit card processing are a case in point. Compare what happens online to paying for a purchase at an offline retailer. You need to do the same to get people shopping online. Site security is a prime concern of potential online shoppers. You have to work especially hard at this because you have to deal with both the reality and the perception of online credit card processing. The reality is that on a secured site, transmitting personal information such as credit card numbers is less dangerous than using a credit card in a 'real world' retail situation, where someone might look over someone else's shoulder and steal the number, or pick the credit card slip out of the trash afterward. During an interview with Melody Vargas, Eric Olafson, Tomax CEO, said, "there is more risk in handing your credit card to a stranger serving your dinner than in shopping online." But the perception of credit card processing is that transmitting personal information such as credit card numbers over the Web is much more dangerous and that hackers lurk everywhere. You must have SSL (Secure Socket Layering) on your online payment pages, so you have the ability to handle encrypted transactions. You must visibly show your potential online shopper that your site is secure and that your online payment systems, such as credit card processing, are safe to use. She or a member of her staff is there to take your money, whether it be cash, cheque, credit or debit card. Too many e-commerce websites make online shopping difficult. If you have an online store, you must offer online payment, such as credit card processing. To accept payment online, you can use an online payment system, such as PayPal, or set up a merchant account for credit card processing. Online payment systems such as Beanstream (a Canadian company) allow you to set up merchant accounts and online payment processing for both debit and credit cards. You'll find more information on online payment systems in the Payment Processing section of this website. Many e-commerce solutions providers include credit card processing with their e-commerce packages. 8) The Traditional Retailer Closes the Sale With a "Thank You; Please Come Again"
You need to do this on your e-commerce website, too. Whether it's a simple screen that comes up after the transaction thanking your customer, a follow-up thank-you email, or a thank-you card that you ship the completed order (or all three), you need to let your e-commerce customer know that you appreciate her business. Blank screens, screens that automatically return to the home page, or screens that just repeat the order form after the transaction do nothing to give people shopping online warm, fuzzy feelings that may translate into future sales. Having a quality product is only one piece of the e-commerce website puzzle. Another is getting potential shoppers to visit your e-commerce site. But even after you've put those pieces in place, you have to entice them to do their online shopping on your site by treating them as well as or better than they'd be treated in a bricks-and-mortar store. Following the eight rules of successful e-commerce websites outlined in this article will help persuade potential online shoppers to make the click that matters.